Hand Weapon. 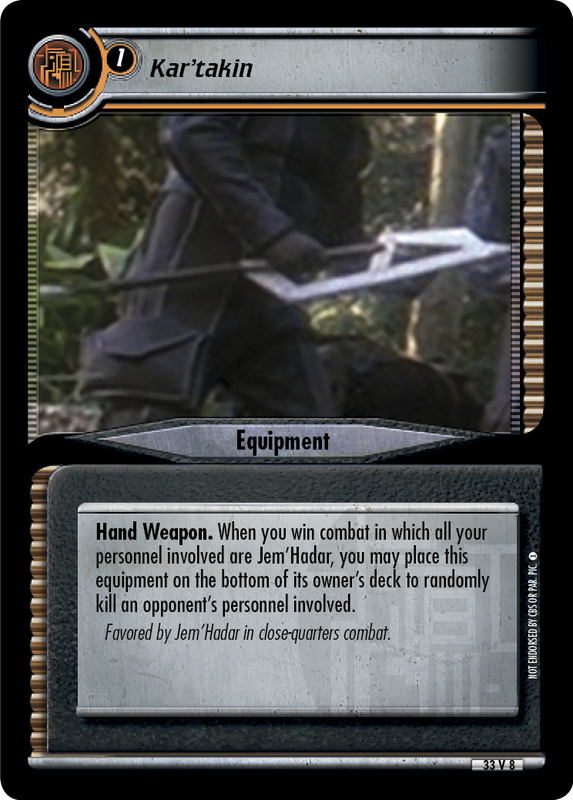 When you win combat in which all your personnel present involved are Jem'Hadar, if this equipment is present, you may place this equipment on the bottom of its owner's deck to randomly kill an opponent's personnel involved. Favored by Jem'Hadar in close-quarters combat. Characteristics: kill opponent's personnel, Hand Weapon. This card has an erratum: The design intent was that this hand weapon should be present during combat to activate the game text. Game text before errata: "When you win combat in which all your personnel involved are Jem'Hadar, you may place this equipment on the bottom of its owner's deck to randomly kill an opponent's personnel involved.". Card logging info: First edited by Telak at Apr 18th, 2015. Please support openCards and validate game text of this card!